The woman is too stupid to have gotten elected on her own. I would not be surprised at all if somewhere down the road a conspiracy was uncovered and confirmed that somewhere, someone or some special interest backed her campaign and got her elected and is now her puppet master. Parties are nothing more than a distraction for elected officials, who should be 100 percent focused on their place in government. Simply stated, parties should be banned. I have never encountered a "party" that was good for "the people" and/or the efficient execution of government. Stop drinking beer! That’d be my last resort! Like any new technology, the AMT has improved over time. Today, most function extremely well. While there are some I like over others, none are bad. I run semi-dump around Chicago (lots of stop and go and bumper to bumper traffic) In your application, I would consider paying up for the Allison. It's worth the investment, and then there's the higher resale value. My pics from Gerhart's in 2009. Nope same old same old! Surprisingly enough the dollar store HP common rail seems to work fine ! Time will tell! C how it goes! So I found an old CB I ran years ago in my pickup truck with it's magnetic aerial. Way back when I rigged it with a cigarette lighter plug. So I figured "What the heck? lemme see if it still works?" I put it in and put the aerial on the roof, and gave a yell on Channel 19 for a radio check and immediately got a "My radio works fine." Last night I had to run to Lowes to get a doorknob and got on I-78. A driver merged into the left lane as I was coming up the onramp. I merged into the slow lane as he passed me in the left lane. I got on the radio and said "Hey thank you driver and you missed me." He came back and said "Yeah I see you I'm not blind, dummy." Got home and ripped it out and tossed it into the trash can. I know I have a sliding 5th from a 79 Cruiseliner. I took it free from the cutoff last spring. Don't know anything about the 5th wheel itself but the slider tracks are bad from rust. It is currently buried on my scrap trailer but I need to unload the trailer until prices rebound a bit. The guy was using it till he junked the truck but I don't know about the sliding part. I'll get it off the trailer and give a look to ascertain if it's worth working with. I get to Lititz, PA every now and then for Gerhart's Mack Meet and will probably be there in October with my current water truck which may not be the same then. I started on a 2 stick when I got out of high school 10 years ago. That's all we had! A '79 and an '80. For a concrete truck trying to back up through soft ground you couldn't ask for a better transmission. Set in 3rd reverse and hit it. I always love shifting gears backing up, I get some strange stares from people! For us, "new" trucks are 1990s. We don't beat our trucks hard enough to get the money out of them to buy anything newer. They get too much idle time for all that new emissions garbage anyway. you mean like obama? i still can not figure out how in three weeks time he went from being "the least qualified candidate running to be elected president" to "the most qualified" the only thing i can come up with is the democratic party during those three weeks determined Clinton did not have a snowballs chance in hell of winning, so they decided if they could not have their first choice, they would force a total idiot on the country. Building a model truck using a 1:1 scale! Donovan Spring in Manchester, NH had a fellow customizing springs and he had all the old books. On any given day, he might be found taking apart some sort of GMC front spring pack to get a particular leaf that would be a perfect match to replace a leaf in a Packard rear spring pack. Hopefully you can find "the old guy" at a spring shop. The fellow retired from Donovan and I have only needed off the shelf stuff so I can't comment on the custom shop these days. The spring width will be determined by the width of the frame spring mounts and the axle perch. The front is a slipper so the length can be fudged a little. Going to take a little extrapolation to do the CL. This 576 has 9 or 10 leaves but who knows if the specs would be the same for you? 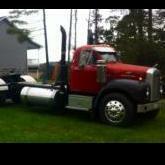 Trans and transfer case are 1962 Mack, Driven Steer is from a 6x6 B model logger from Oregon. The Driven steer is with in 1 1/2 '' over all width from spring pad to spring pad to the B steer and the same width hub to hub. Same driven steer that was put in the B8136SX unit. Rear bogies are Mack SWD68 series. mainly I need leaf count, width and length of the leaves to have them made up. Basically I'm building a copy of a 8136 chassis. Yep, sad but true Randy. Nowadays the joke is "backup radio", because the only time they turn them on is when there's a backup- "hey, what's going on?..why are we stopping?". Mine is on from the time I start the truck, but I can understand "backup" radios because of all the B.S. and nonsense going on in the mean time, mostly from local base station a-holes that seem to just want to aggravate truck drivers. Nashville, Tenn. As for a healthy direction, first you need a "healthy government" something I do not see returning. Sadly I fear the divide is only going to get much, much worse. A 67 series, most likely, yes. However, it could also be a triplex, or quadraplex too as a duplex wasn't the only option. she has a degree in idocity from boston unversity. i think the democrat party is priming her to take over for pelosi, feinstein, and waters. She did come up with the cow fart solution and the air travel solution. Soy milk, wild rice and Salmon is the only food needed because all the rest is unhealthy and blimps with solar powered electric motors can fly as fast and as far as airplanes. Looks like she bought the Obama unicorns. Indoctrination instead of education, being a minority you are owned for the oppression and lack of opportunity but mainly lack of parental guidance because their parent(s) are only slightly older than them. .
Yep, it's a different crappy world out here now. We don't even use CB's where I am any more. All us guys that work together use two-way radios. Better range and you don't have to listen to all the new breed of highway truckers. Never was an ENDT-676 engine rated at 237hp. That was an ENDT-675 series. I believe all of the ENDT-676 series were good to build additional performance into but some of the ENDT-675 would give problems. Main saddle cracking from block twist was one problem. The ENDT-676 series was Mack's first foray into intercooling to up horsepower ratings with the first ones being about 1977. I remember them new but was just starting to venture into a short tenure of being a truck "mechanic". I ceased that type work full time in 1984 so anything later is just passing knowledge to me. Never was around the four valve E6 series as example. Never have worked on one. Or how about when a trailer is unhooked from log rubber and the next guy goes under with short rubber and a lower 5 wheel and overshoots the wheel and hooks the front of the plate with the trailer pin. We rented out a trailer to another company and the driver was bragging how great a driver he was, backed into the trailer and didn't tug the pin and he left the trailer laying on the ground he came back in the office and we made him crank the trailer up and fix the air hoses and cord . We had a good laugh over his misadventure. Saw a driver do that to somebodies rig at a truck stop in Kentucky many years ago. I went in side and found whose rig it was and told him someone pulled his pin. For the life of me I will never understand someone being that malicious. I'd more than likely spend a few hours with the constable explaining how the weasel kept hitting his body on to my boot. Completely different mounting surfaces. No go. it is had enough trying to find drivers these days that can drive a manual trans. and you want them to run a twin stick?? Cultural decay and declining standards of behavior in the United States. I don't go looking for such indescribably painful news, but how can you avoid these reports when they're happening every day all across America? This has become the new norm. Obviously American society has very serious issues, and yet our government neither discusses nor addresses it. Go figure.